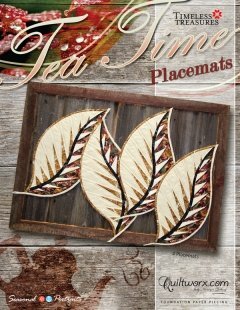 Tea Time Placemats is another of the patterns released from the new line of Leaf designs! Cute, fun, small, fast, and striking, these little leaves are sure to impress at any tea time gathering! Quiltworx.com completed four placemats, complete with quilting, in less than a day. These also use our newest paper piecing technique, called Curved Paper Piecing, to add the vein element of the leaf. With a simple binding around the shape of the paper pieced element, these little leaves can be hung on a wall in a collage, or placed on a table as a feature element. You can also create a background and applique the leaf to the top, if you like! The Seasonal Portraits fabric collection was used to make the placemats shown on the cover. We have already put together a few different colorways and expect to see leaves galore submitted to us in a million different colorways.